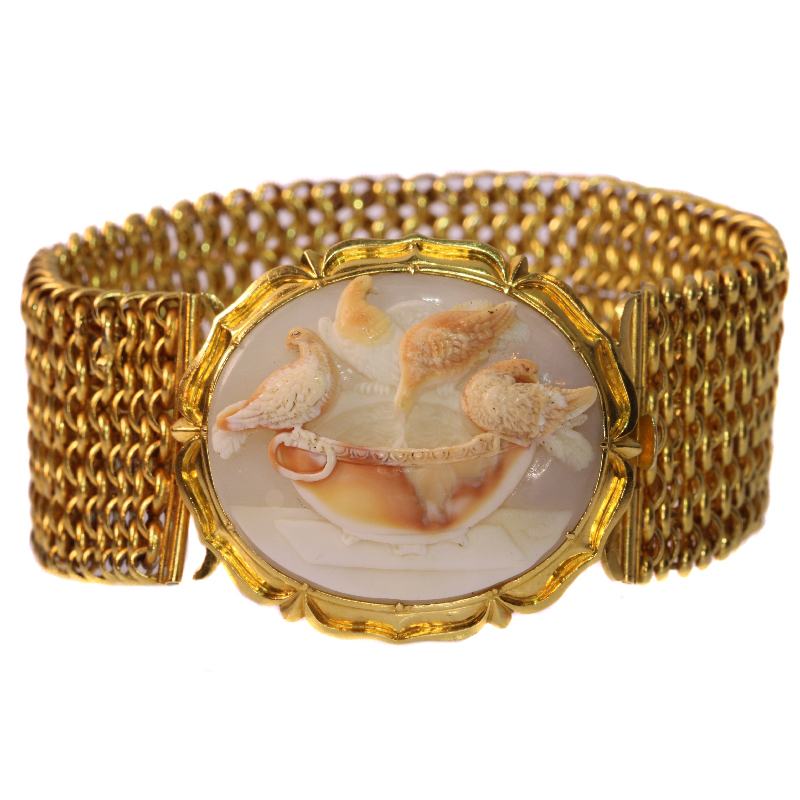 Magnificent antique cameo bracelet with presentation of so-called Doves of Pliny: Description by Adin Antique Jewelry. As three downey doves are sunbathing from the rim of a basin while one is gracefully drinking in this picturesque cameo, this 14K yellow gold bracelet from around 1850 splatters history all over our Garden of Adin. This exact composition of four plumose pigeons is called "Doves of Pliny" or "Capitoline Doves", which refers to Pliny the Elder as he describes the original picture in a classical mosaic by Sosus of Pergamon dating back from the 2nd century BC. A revival of these archealogical wonders can be seen in the 1st half of the 19th century as it was very popular to reuse this motif in various artefacts. And yet, we have never seen a piece of such superb quality as the one we've got here. To emphasise its excellence, we invite you to closely lean over to the water in the vase and to notice the subtle reflection of the drinking dove. Apart from this meticulous elaboration, it is exactly this particular fragment by which Pliny was as equally mesmerised as we still are today. Only rarely, an artist manages to bring out this section of this iconic image. Furthermore, this cameo has been engraved in the hardest part of the shell, which provides an even more realistic appearance as there are three different colour layers. Let alone the level of craftmanship needed to sculpt every detail a material as hard as stone, which we believe to take its origin from an Italian hand. Of course, this piece of artistry can only be brought to its full spectacle in a harmonious mounting, which most probably must have come from an English goldsmith. Theme: Doves sunbathing and drinking on a vase. Extra information: "The doves of Pliny" or "Capitoline Doves" - Original design by Sosus of Pergamon. - Originally a mosaic showing doves drinking from a bowl, from Hadrian's villa, 2nd century AD, probably a copy of Sosus's work. Sosus of Pergamon was a Greek mosaic artist of the second century BC. He is the only mosaic artist whose name was recorded in literature. After the conquests of Alexander the Great, the Greeks of major centers such as Pergamon and Alexandria displayed their wealth in decorations that included mosaics. Pliny the Elder names Sosus as the artist who created the "Unswept House" mosaic. This depicts the floor of a room covered with the remains of a feast, including fish, fruit and other fragments of food. Pliny also says Sosus's mosaic work included an image of a dove drinking, and that the water reflected the shadow of the dove's head. The image, meant to be mounted on a wall, was said to be so realistic that real doves flew into it while trying to reach their stone companions. A mosaic from Hadrian's Villa, now in the Capitoline Museums, depicts a group of doves on a round bowl. As described by Pliny, one dove is drinking while the others are sunning themselves. The Doves of Pliny, or the Capitoline Doves depicts the doves artistically but realistically. The mosaic is made only of cubes of colored marble, without any colored glass as in other mosaics. It was discovered in 1737 during excavations at Hadrian's Villa led by Cardinal Giuseppe Alessandro Furietti, who thought it was the mosaic that Pliny had described, although other scholars think it is a copy of the original that was made for Hadrian. The Hadrian's villa mosaic has in turn been copied many times in many formats. (From: Wikipedia. Precious stones: One cameo which is cut from the most difficult part of the shell to engrave. To be even more precise, it's the section with the rotation. This is the hardest part of the shell, which is almost as hard as stone. However the advantage to use this part of the shell is that it consist of three different colour layers. Hence the gray background of this cameo. Brand: However some people would attribute this cameo to the workshop of the famous carver Tommaso Saulini (Italy 1793 - 1864), we do not share this opinion. Although the craftsmanship of the cameo is of high standards, we think that such attribution is wishful thinking.